Spray waffle maker with cooking spray; heat waffle maker. Heat oven to 350°F. In medium microwavable bowl, mix brown sugar and hot sauce. Microwave on High 1 minute. Stir mixture; pour into bowl with cooked shredded chicken. Stir to combine. Line 2 cookie sheets with foil or cooking parchment paper. Place 4 waffles on each cookie sheet. 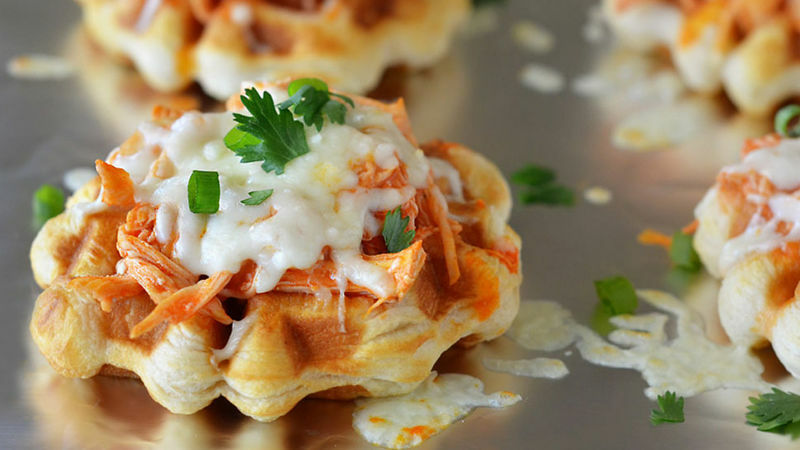 Top each waffle with 1/4 cup chicken mixture; top each with 1/4 cup cheese. Bake in oven 5 minutes or until cheese is melted. Spoon dressing over each warm waffle; sprinkle with green onions. Serve immediately. Plan ahead because this recipe uses pre-cooked chicken. Add chopped cilantro for added flavor!